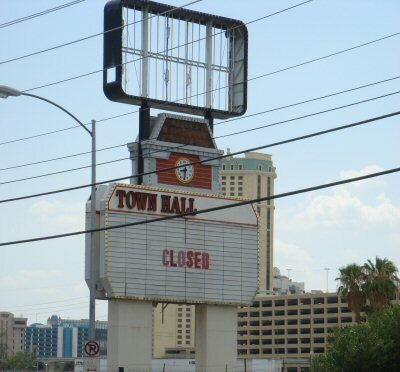 Although the Boyd Gaming Press Release originally stated that demolition of the Stardust would begin in the first quarter of 2007, there is now speculation that it could be imploded as soon as New Years Eve. I’m not sure whether this rumour has much substance – it seems a bit too soon, although if the auction next weekend is as efficient as it looks I guess there won’t be an awful lot left to clear out. Boardwalk closed this year on Jan 9th and it was four months until the freakish clown head and fake roller coaster were removed and the building was imploded on May 9th. Of the twelve previous casino implosions, only the Hacienda fell on New Years Eve, back in 1996. Somehow I thought it was a lot more. However it would be typical if we just miss this one by a day – we fly back on Dec 31st, after deciding to trade a non-stop return flight and triple diamond club miles for that extra night of fireworks and complimentary plastic hats. We were in town in February this year when Bourbon Street went boom, although good old Harrah’s kept it quiet until a few hours before they pushed the plunger and I only heard about it the following day. Castaways was blown up with a similar lack of fanfare just a few weeks previously. Apparently, making a spectator event out of watching tower buildings collapse is not considered particularly tasteful any more. The afternoon before the Bourbon Street implosion we’d got stuck in horrible traffic around there, noticed "something odd going on" and even the road closure notices. Never even thought that might be happening, or you can be sure we’d have found a prime spot to watch the destruction with a big foam finger and a little flag saying "Go Rubble!". I know we wouldn’t have been alone. Actually we had made more of a connection with Bourbon Street than to Stardust. It was actually the home of our first Vegas beer – two small plastic cups of draft Budweiser. 50c each! On our first trip we were pretty clueless, and – as well as paying for beer – had ended up staying at the Days Inn Town Hall Casino on Koval, just around the corner. It’s also now dust, although with one blackjack table and a dozen video poker machines, the Town Hall isn’t the type of casino to be missed.